If you were a fan of ‘Queer is Folk’ and have been bemoaning the lack of gay-centric TV since we waved goodbye to ‘Will & Grace’, then no more drama please. Because Thursdays just got gay! Way gay. 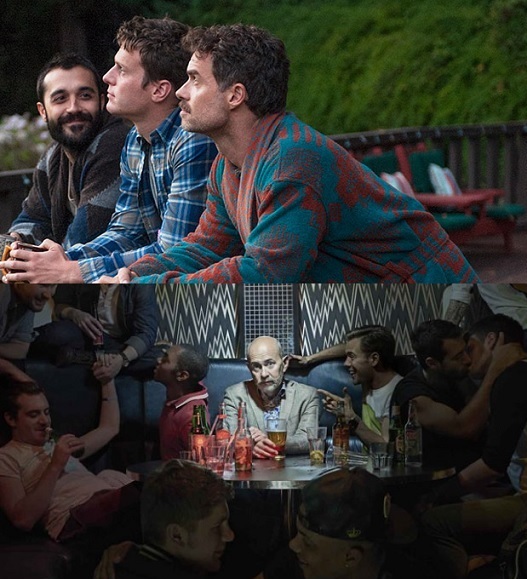 Although the past decade in film and TV has witnessed a major shift in how gay characters are portrayed on screen, with great writers recognising there are as many shades of gay as there are grey, the Thursday night double bill of ‘Cucumber’ and ‘Looking’ is still a coup for anyone seeking contemporary – and quality – stories that explore gay lifestyles. Russell T Davies’s new show – along with its ‘Skins’-esque ‘yoof’ spin-off ‘Banana’ – has got over the initial shock tactics to settle into a nice groove, displaying a wicked sense of humour and some truly offbeat characters amongst all the filthy chatter. Meanwhile, Andrew Haigh’s post-‘Weekend’ HBO project ‘Looking’ returns to Sky Atlantic tonight with a second season opening double bill; although it shares the same frankness of ‘Cucumber’, if the neurotic characters and indie vibe of the first season continue then we can expect something dryly funny, emotionally compelling and entirely different to the British eccentricities of ‘Cucumber’. It’s just too bad ‘Looking’ seems to have been shafted with the graveyard post-11pm slot and no longer follows the ‘Girls’ it did back in 2014 – paired with that zeitgeist comedy drama, ‘Looking’ provided a refreshingly honest look at twentysomething gay life alongside Lena Dunham’s own snapshot of a generation.